If you’re a close reader of my blog, you’ll know that I sometimes get fixated on certain books and ingredients. 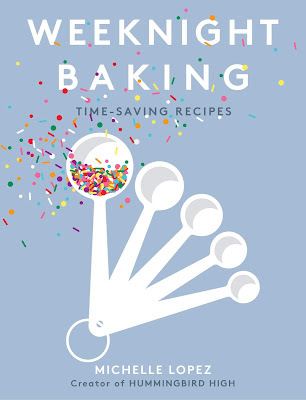 Like that time I baked through the Hummingbird Bakery Cookbook, and most of Momofuku Milk Bar and The Brown Betty Bakery Cookbook. Or, last summer, when I spent the entire month of May and June making all the rhubarb and strawberry desserts that I could think of. Unfortunately, it’s that time of the year again folks. Because strawberries are officially OFFICIALLY here. No more of that slightly watery, first of the season misshapen berries that I’ve been instagramming — these babies are the real thing. Plump, juicy and ruby red, complete with little green hoods that you can pull off with the gentlest tug. Nothing beats Oregon strawberries. Yep, I said it. Take that, Californians! Today’s dessert is a classic French dessert with a little bit of an Asian twist — coconut cream and Thai basil. Since I’ve been baking with strawberries so much, I wanted to explore something new instead of the usual combinations. I'm a big fan of The Flavor Bible, which is one of my main resources in the kitchen. Instead of recipes, The Flavor Bible presents different flavor pairings and affinities for different ingredients. It's essentially a giant index where you can look up an ingredient and it will tell you what else it works with. For instance, under the entry for strawberries, you get the usual suspects like strawberries and cream, strawberries and rhubarb, strawberries and bananas. BUT you also get some more unique pairings... like strawberries and balsamic vinegar, black pepper, and basil. I wasn't quite ready to try strawberries with balsamic vinegar or black pepper, but the combination of strawberries and basil sounded intriguing and refreshing to me. I initially played it safe and infused the basil's herby flavor into the strawberries by tossing the fruit with a couple of basil sprigs and a tablespoon of sugar. The sugar drew out the juices from the strawberries (in a process called maceration), and which the basil then infused. Eating the basil-infused strawberries straight from the bowl was an utter delight — the basil added a subtle, almost peppery flavor. 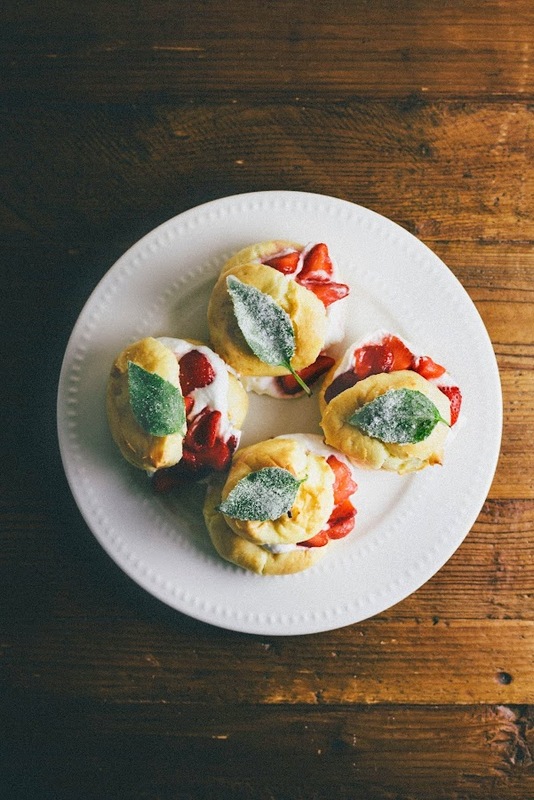 However, when I added the strawberries with the coconut cream in the profiteroles, the coconut cream ended up drowning out the basil flavor. I ended up topping each cream puff with a candied basil leaf to try and bring back that herby, peppery kick. The end result was an absolute delight, and the cream puffs were gone in less than an hour. I used Thai basil because that was the kind of basil I had lying around in my fridge. You can substitute Thai basil with regular (Italian) basil, but bear in mind that Thai basil tends to be mintier and slightly spicier than regular basil. Similarly, I used coconut cream because I also had some lying around my fridge. Note that coconut cream is distinctive from coconut milk. The Kitchn has a great article on the difference between the two. Coconut cream is usually available in the Mexican or Asian section of any grocery store. If you can't find coconut cream, you can also use the coconut cream that usually comes with coconut milk. If a can of coconut milk has been sitting for a while and isn't shaken properly before opening, the cream usually sits on top of the coconut water, which you can scoop out and use in this recipe. Just make sure that the coconut milk is as cold as you can get it (preferably chilled overnight), otherwise it won't whip up properly. Cream puffs are made from a pastry dough called pâte à choux, or choux pastry, which is the base dough of baked goods like cream puffs (also known as profiteroles in fancy-talk), eclairs and crullers. Choux pastry consists of nothing but butter, water, flour, eggs and a touch of sugar. The butter, water, and flour are combined and cooked together in a sauce pot to eliminate moisture from the dough so that it can ultimately absorb more fat. If you haven't made choux pastry before, it'll seem strange to combine butter, water and flour and cook it over the stove top, but trust the recipe! It will create a delicious, airy, melt-in-your-mouth eggy dough that won't require any additional leavener to puff up in the oven. Traditionally, choux pastry is transferred to a piping bag and piped into shapes (like eclairs or crullers). Cream puffs are thankfully a little more low maintenance — you can use an ice cream scoop with a lever (I think these are technically called cookie scoops) to portion out your dough into even balls. I highly recommend in investing in a cookie scoop — it'll save you both time and a mess in the kitchen. Brush each Thai basil with the lightly beaten egg white, before lightly dipping each leaf into a bowl containing 1/2 cup granulated sugar. Allow the petals to dry on a sheet of wax paper for 2 to 3 hours until completely dry. 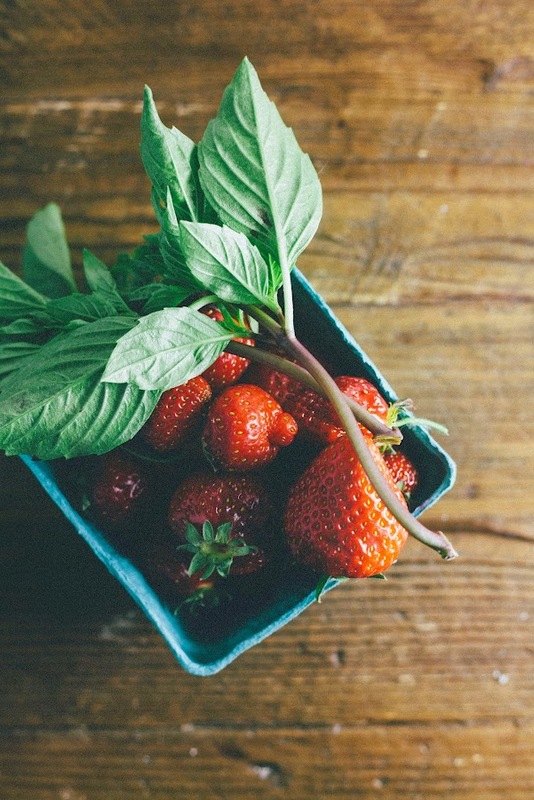 In a medium glass bowl, toss together 1 pint hulled and quartered strawberries, leaves from 4 Thai basil sprigs, and 1 tablespoon granulated sugar. Let sit until the strawberries begin to release their juices, about 10 - 15 minutes. Toss occasionally to allow basil to infuse. 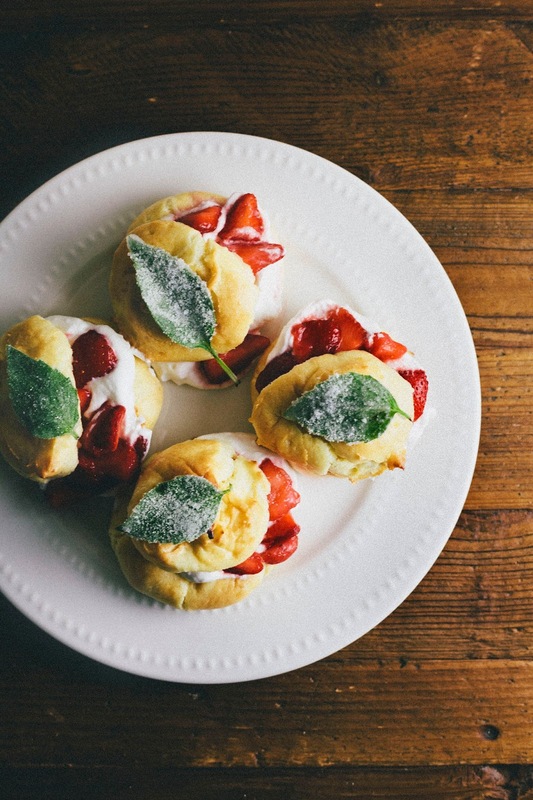 While the strawberries are macerating, make the profiteroles. Preheat oven to 450 (F), placing oven racks in the center and upper third of the oven. Line two baking sheets with parchment paper or Silpat mats and set aside. Use a 3-tablespoon (50mm) cookie dough scoop to portion out dough balls that are about 1 1/2 inches across and 3/4 inches tall. Space each dough ball about 1 1/2 inches apart on the prepared sheet pans. Bake in the preheated oven for 10 minutes, before rotating the pan from the bottom shelf to the top shelf. Reduce the heat to 350 (F) and bake for another 15 minutes, cracking open the oven door for the first 5 minutes to allow heat to escape and the oven to cool more quickly. When the dough balls are a golden color and crisp on the outside, remove from the oven and allow to cool completely on the pans, placing each pan on a wire rack. In the bowl of a freestanding electric mixer fitted with a whisk attachment, combine 1 cup cold heavy cream, 1/4 cup cold coconut cream, and 1 teaspoon vanilla. 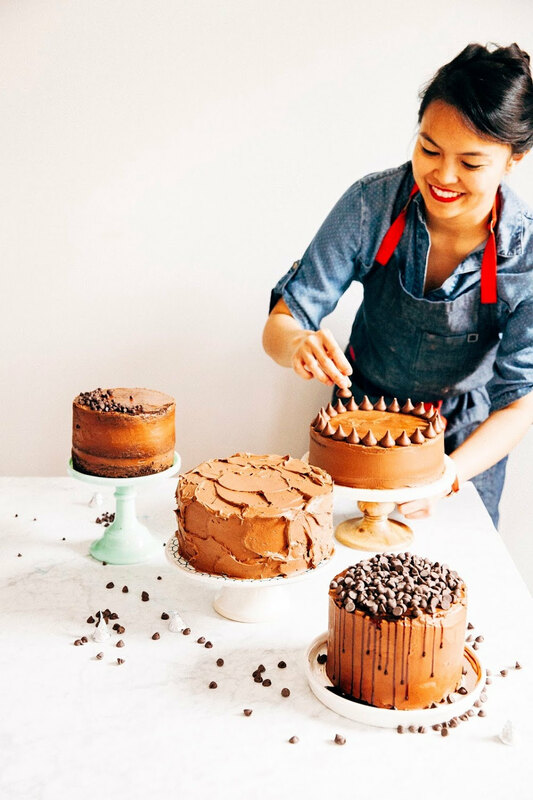 Whisk on medium-high speed until the mixture starts to thicken; add in 1 tablespoon confectioners' sugar and whip until the peaks just hold their shape — be careful not to overmix or you'll end up with butter! Once the profiteroles are completely cool, slice each profiterole in half. Use a 1-tablespoon sized cookie dough scoop to divide the coconut cream filling evenly on a half of each profiterole. Discard the basil leaves from the strawberry basil mixture. Spoon the strawberries evenly between each profiterole. Sandwich the strawberries and coconut cream with the remaining half of each profiterole. Top with a candied basil leaf and serve immediately. Cream puffs are always best the day they are made! I totally love your enthusiasm about strawberry season and all the gorgeous pics you've been instagraming! 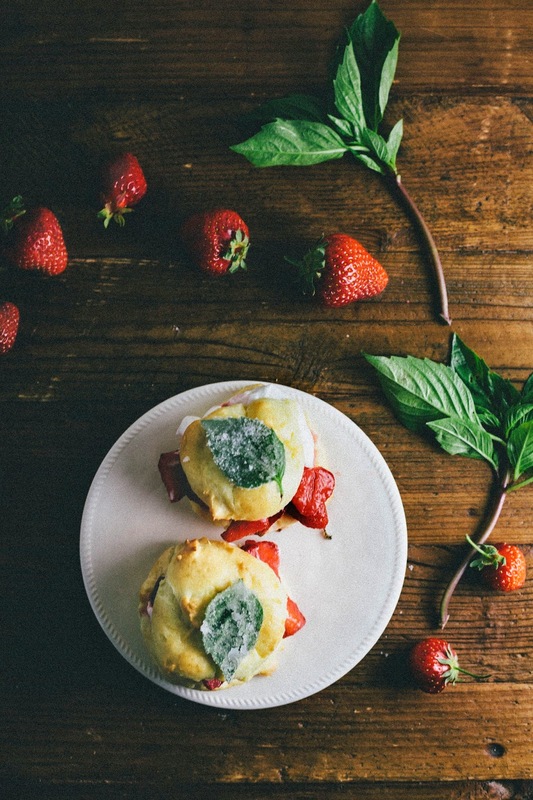 You've totally got me hooked and all I can think about at the moment is strawberry recipes ; ) This is a totally great combination of flavours too - I love strawberry + basil together (and you should definitely try strawberry + balsamic, it's the best) and these sound like perfect summer-y bites. Strawberry season is really such a blessing, isn't it? I love the infusion of these flavors--genius, girl! I'm going to take london bakes's suggestion and do the balsamic combo sometime as well. Hope you're enjoying the lovely berries, off to buy a flat from the market soon! I've been doing strawberries and balsamic before it was cool! It really takes on a taste of it's own! And I totally agree... take that Californians! Love strawberries and basil. Have never tried them with Greek Basil but bet that it's even better with them than normal basil, as it has an almost liquorice-y aftertaste to it. And I love these pretty choux buns - divine. i have been looking for REAL STRAWBERRIES too...no luck yet. the idea of candied basil is scrumptious. Oh my goodness... Those look delicious!!! Care to share? Oh my gosh, SO much to love about this post! 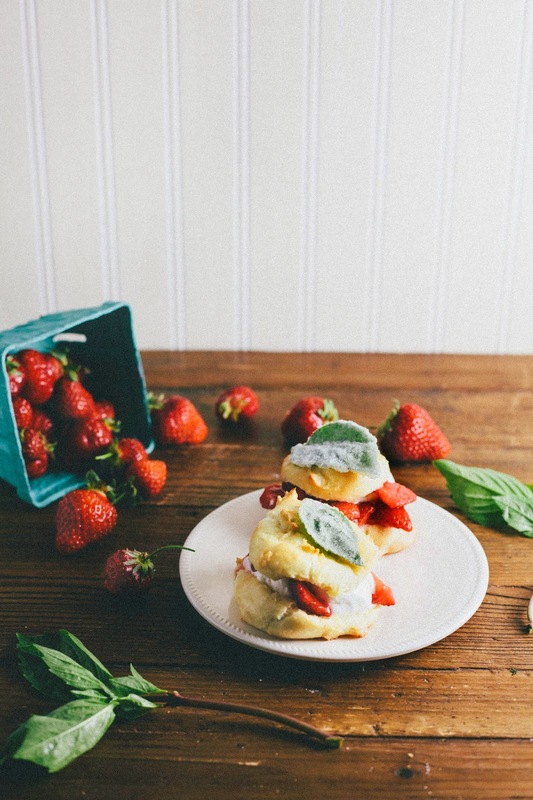 Basil, strawberry, and coconut sound like a phenomenal combination (especially with Thai basil! Ahhh!) and on choux pastry, I can't even. Amazing. Also, the Flavor Bible sounds like something I need to pick up ASAP ... I have to second Skye, strawberries and balsamic are SO right. Roasting strawberries in balsamic vinegar = maybe the best decision I have ever made. OH MY GOOD GOSH these look amazing. Flava bomb!!!! First thing on my list for when I come to Portland (in exactly one week!!!!!!! ): eat ALL THE STRAWBERRIES. Second: hang out with you. !!! !